Department of Fire and Emergency Services staff member Talei Hatch donates blood at the Midland Blood Donor Centre. MIDLAND Blood Donor Centre is facing a shortfall of 300 donors this month, prompting the Australian Red Cross Blood Service to launch its winter campaign for new donors. The blood service has partnered with emergency services across Perth to see which service can recruit the most donors. Staff and volunteers from WA Police, Department of Fire and Emergency Services, St John Ambulance and State Emergency Service are all taking part in the challenge. 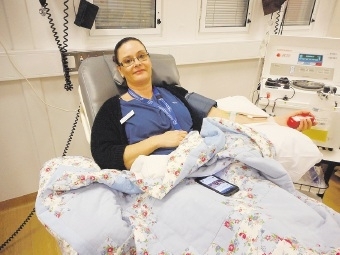 “We’re hoping this challenge will help by inspiring emergency service personnel and other people living in Midland and the surrounding area to donate blood to help combat this shortage,” Blood Service spokeswoman Jessica Willet said. “Winter is always a difficult time for blood donations because you need to be feeling 100 per cent well to donate. “We’re concerned that the flu season could result in a drop in donations. “Patients fighting cancer, infections and blood diseases are relying on donated blood to keep them healthy throughout winter. Ms Willet said emergency service workers saw the benefits of blood donation every day through their work, but people did not need to be a professional life-saver to help save lives. “If you’ve escaped the cold and flu season and are feeling 100 per cent healthy, you may be eligible to donate,” she said.